Here’s some quick background information for city-dwellers like myself who haven’t got the foggiest idea about botany, trees, flowers, wildlife or nature in general. 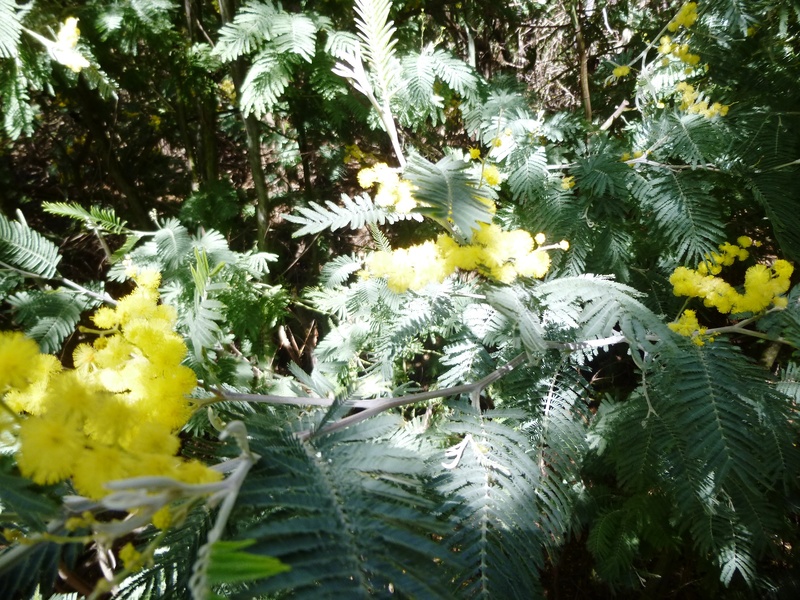 The mimosa itself is a large green tree of the acacia family and has around 800 species: they are used mainly for decoration or hedges but the flowers can also be used for perfume. Though it is now cultivated mainly in South Africa, Australia and France, the mimosa is not at all indigenous at all to the French Riviera: it was brought in the late 19th century from Australia, notably by the British nobles who came to live in the area and wanted to add some colour to their gardens (we all know how the Brits love their gardens!) and then strongly promoted by the local horticultural societies, as well as being used in the perfume industry, centred around Grasse. It’s a shame that the Brits didn’t decide to bring over wallabies and koala bears at the same time, otherwise the Riviera would be quite different right now! 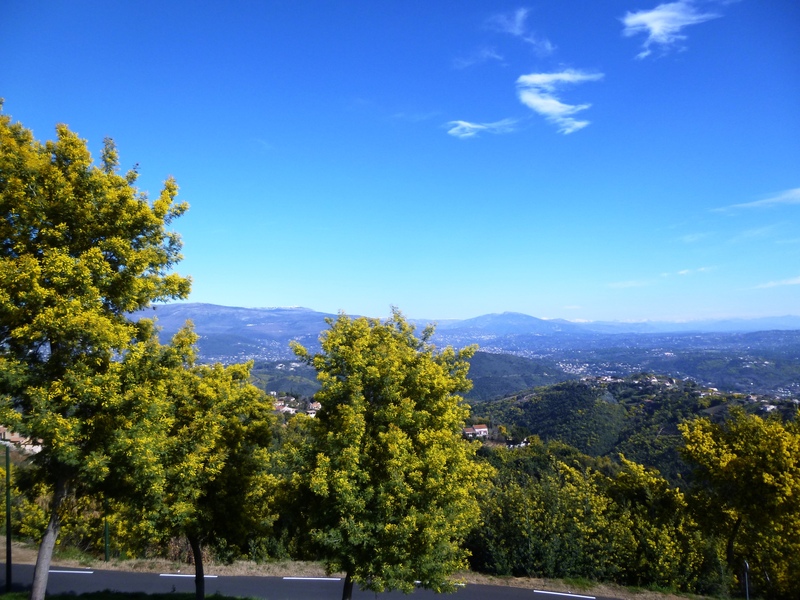 Nowadays, the mimosa trees extend over a 130km arc from the western Var coastline in Bormes les Mimosa, via Sainte-Maxime, Saint Raphaël to Tanneron then across the border into the Alpes-Maritimes through the village of Pégomas to Grasse, something which the local tourist boards have marketed as the “Route du Mimosa” (the Mimosa Trail – the website is only in French but I managed after a long search to find an English document that can be downloaded via this link). This is easy to understand, because since their introduction, the mimosas have become a symbol of the French Riviera and synonymous with the winter sunshine in the area, even though some French protectionists like to campaign about the fact that they were unfairly introduced, have invaded the local eco-system and are very flammable. I’m tempted to say who cares whether they are Australian or not, they still look nice! Exploring the mimosa trail, a hike around the “Crêtes de Tanneron”. 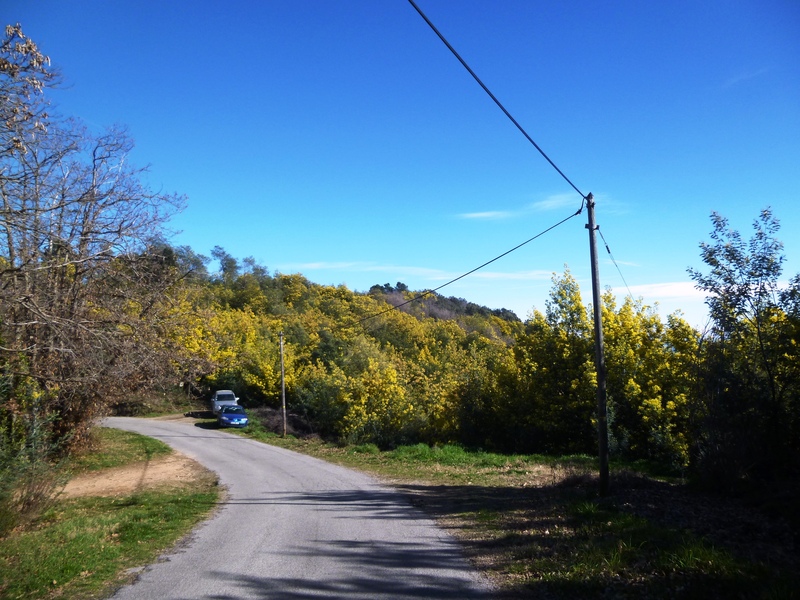 Now concretely, there are two ways to properly explore the mimosa trail and enjoy the winter sunshine: if you have more time and are already based in the area, just take a full day to drive along the small country roads between Bormes les Mimosa and Grasse and soak up the bucolic atmosphere of eastern Provence. The other option is to hike around the area with the highest concentration of mimosas, centred around the tiny but picturesque village of Tanneron. This solution is ideal if you have a car but are based closer to Nice, as it’s just under an hour’s drive away. This is the option I took on a beautiful, sunny but not so warm day, following a hiking trail known as the “Crêtes de Tanneron” (the slopes of Tanneron) as well as the “Route de l’Or” (Golden Route) which, according to the marketing, provided the best viewpoints of the mimosas, the French Riviera and the Esterel mountains. The hike itself can be downloaded via this link, which is only in French (of course, why would any foreigners dare to follow a hike? ), but is pretty self-explanatory: the guide indicates 15km and 5 hours but beware, we went at a reasonable pace without long stops and it ended up lasting around 6 hours and 20km according to the GPS, so it was pretty exhausting. Still, I’m glad I did it – here are some of the highlights of the walk, bearing in mind that it’s a loop so you can’t really cut across if you’re tired half way through (but see my cheater’s guide at the end if you can’t be bothered)! Tanneron is located in the foothills of the Esterel mountains to the west of Grasse and is the de facto capital of the mimosa industry in the area so acts as a great base to kick off. There’s really not much to see or do there but there are a couple of coffee shops and restaurants as well as typical French bakery for you to stock up before the hike. From the village car park, walk downhill for around 30 minutes until you reach the Aubarie river valley. 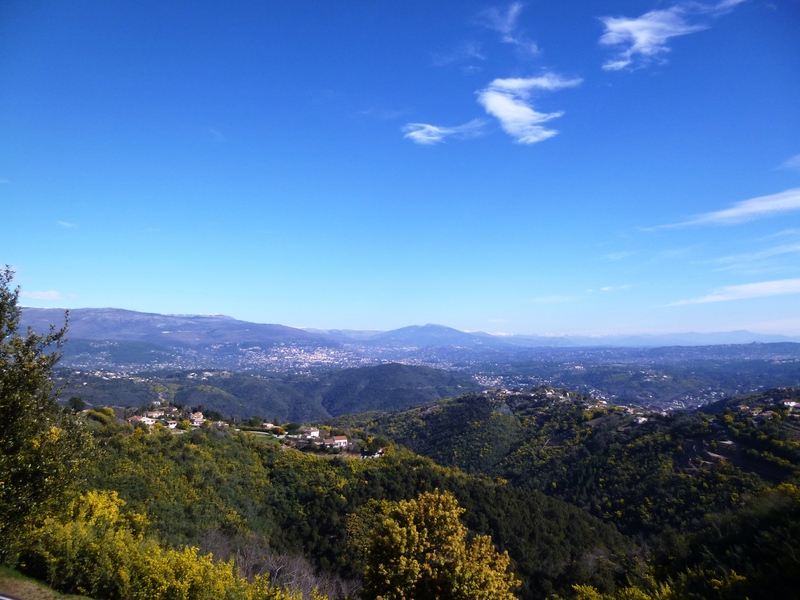 Besides, the views towards the east when leaving Tanneron are absolutely amazing, you can see over to Vence and the Baou de Saint Jeannet, the Alps in the Mercantour National Park and down the coastline up to Mont Agel and the Tête de Chien close to Monaco! Carry on following the river valley for around 45 minutes, crossing the shallow river several times, make sure you have waterproof hiking boots! 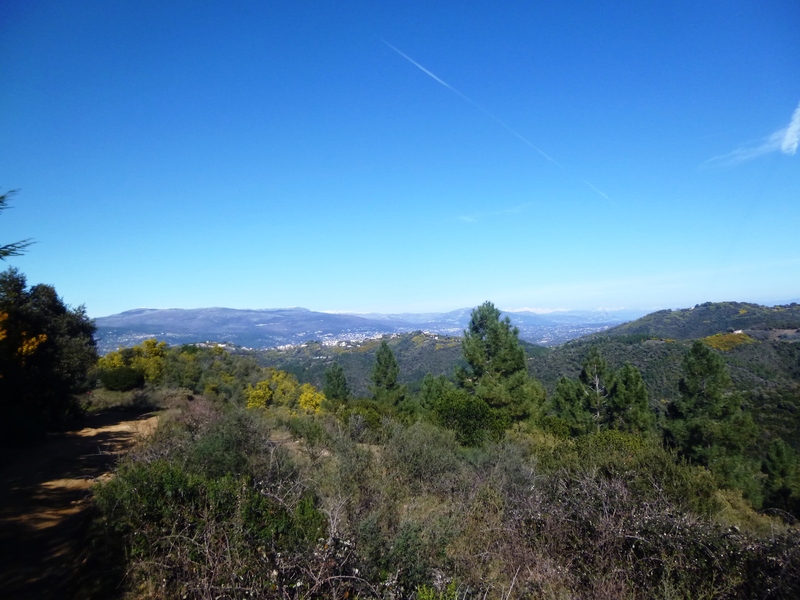 Then comes a big, pretty tough 1-hour minute climb up towards the top of the hills, the view is worth it though with a nice panorama over Grasse and the western part of the Alpes Maritimes. It’s also a great place to stop over for a picnic lunch as it marks more or less the halfway point. The best part is the 1-hour long middle section, near the small hamlets of Les Farinas and Les Grailles, with only a gradual climb and you get to walk through a canopy of mimosas. 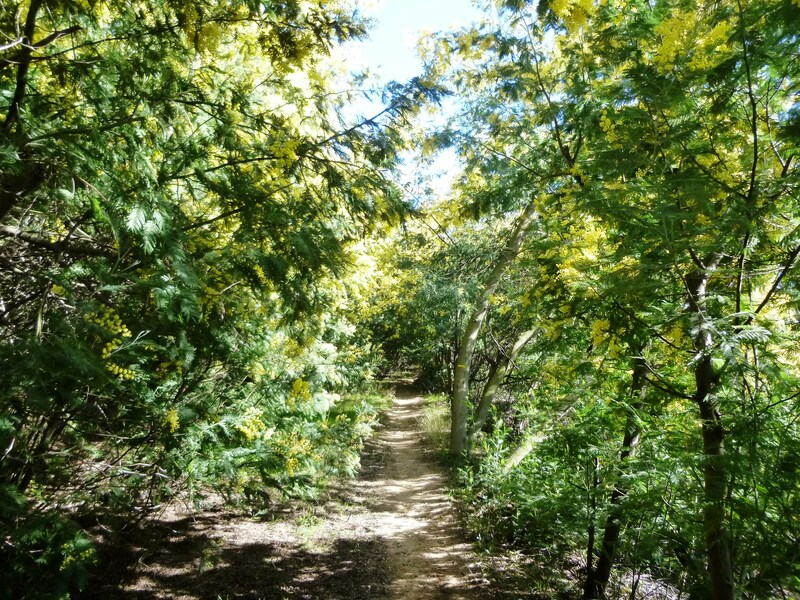 This is where I finally understood what the fuss was all about… Beautiful scents, the yellow colour of the mimosa flowers glistening in the fresh air and the sun flitting through the canopy. 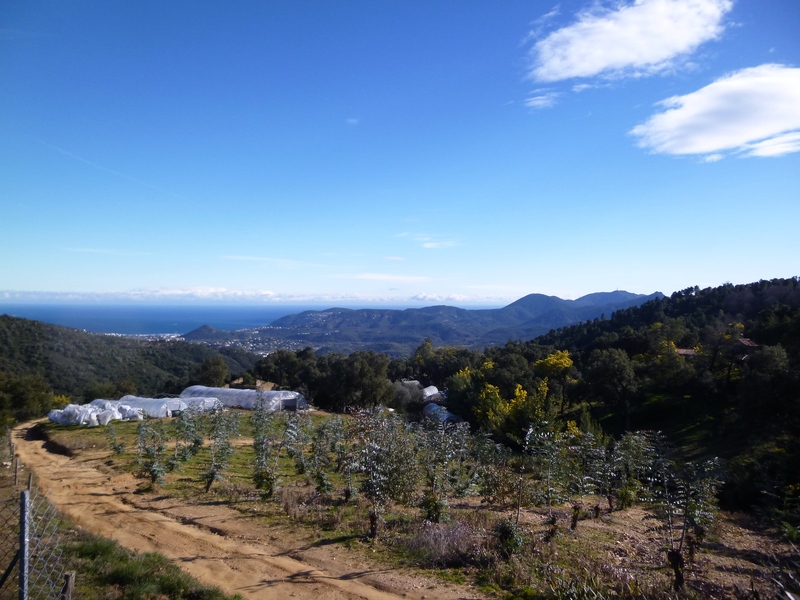 This section also features great views over the Esterel mountains and the coastline. The wonderful mimosa canopy, making the whole hike worthwhile! The 2-hour walk back to Tanneron is beautiful but also pretty tiring, especially the last 30 minute climb to get back to the village after you’ve been walking for the last 5 hours or so. Enjoy a well-deserved drink at the bar in Tanneron and have a rest before the drive back. This hike can be done any time of the year but obviously preferably between December and March to see the mimosas in full bloom. Now as I mentioned, you need to plan a whole day for the 6-hour walk and don’t forget that the days are much shorter in winter so start early and don’t let yourself get caught out by the sunset as this walk is long – make sure you have plenty of water but also dress in layers as it can get quite chilly as soon as you are in the shade, despite this not being a high altitude walk. Head straight for the hamlet of Les Farinas/Tanneron up a windy road from the Mandelieu motorway exit (40) – use your GPS to guide you there! Once you get to the small row of houses, park your car there and walk south-west in the direction of the Esterel mountains and the hamlets of Les Grailles and Les Margoutons. Mimosas in full bloom and directly accessible by car via Les Farinas! 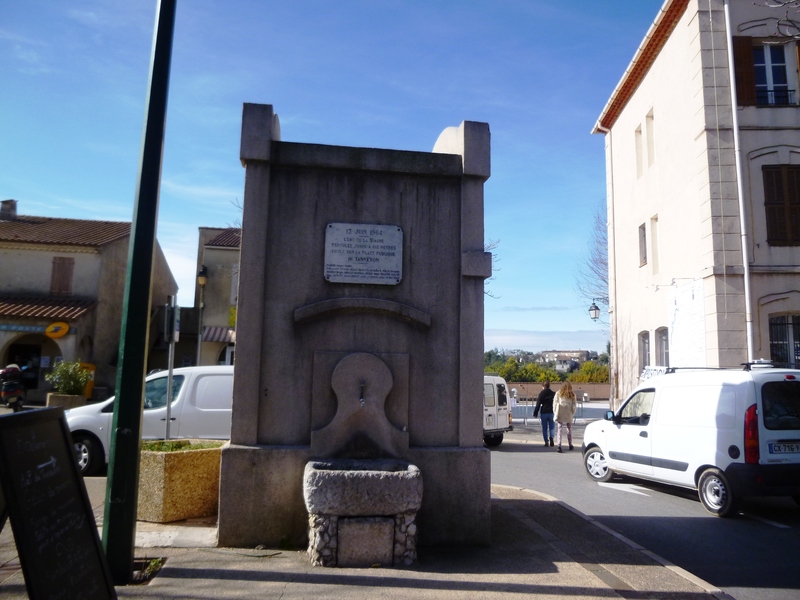 This is the heart of the mimosa trail and the best bit of the loop, so just wander down the road (which doesn’t have a great deal of traffic on it) in the general direction of Les Grailles, walk for another kilometre or so past the hamlet, enjoy the great views over the Esterel then walk back to your car. Once you’re done, head back to the village of Tanneron for a nice lunch or a coffee. Now that was a bit easier, wasn’t it? Tanneron is located at the border between the Alpes-Maritimes and the Var, just 50km west of Nice. If you take the A8 motorway from just about anywhere, get off at the Cannes la Bocca exit and head up via Pégomas, it shouldtake under an hour to get to the village. Getting there by car is now the only solution as the only bus line from Cannes has now been discontinued. For the hiking trail, you will need proper hiking boots, I would also advise sticks and plenty of water. Please see my Practical Guide to Hiking on the French Riviera article for more information on how to prepare yourself. Oh, and this may seem obvious but don’t go if you’re allergic to pollen of course! 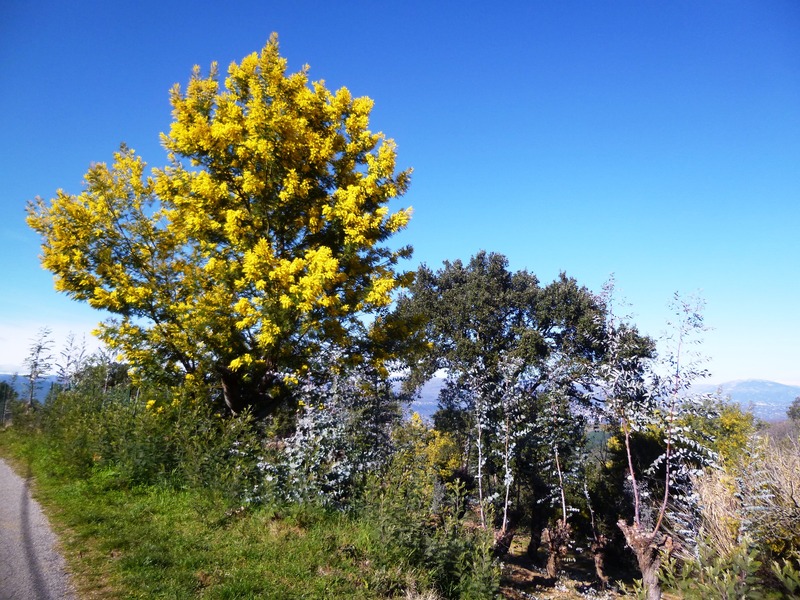 All in all, the mimosa trail around Tanneron makes for a great excursion in the countryside if you are lucky enough to enjoy a sunny day during the winter and fancy testing the great outdoors, so give it a try! 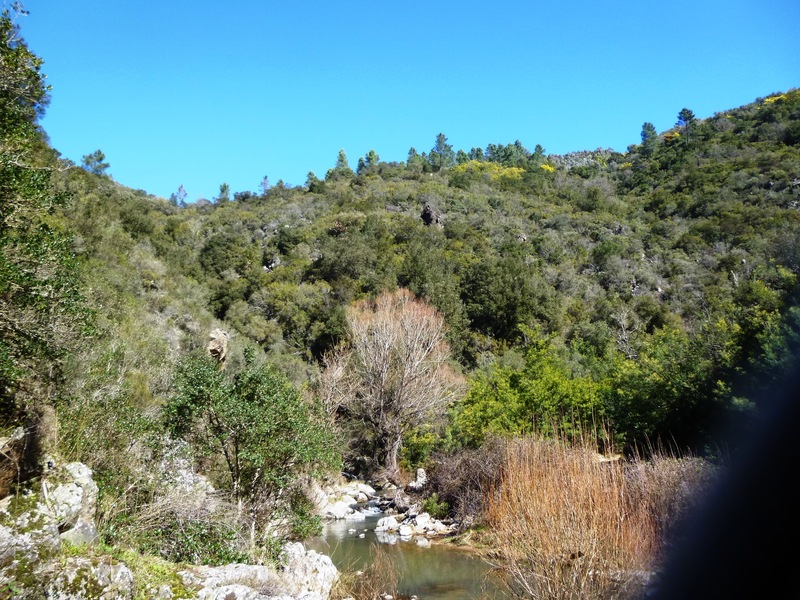 This entry was posted in The hinterlands of the Riviera, What to see on the French Riviera and tagged cannes, farinas, french riviera, french riviera blog, grailles, mandelieu, mimosa, mimosa trail, pégomas, route mimosa, tanneron, Var. Bookmark the permalink. looking forward to trying this hike this fall.